Advocates for the University of Oregon – students, alumni, faculty, staff and others – were set to converge on Salem today (April 11) for the UO's once-every-two-years Day at the Capitol. The object of the event is to inform lawmakers and others about the university's accomplishments and reach. 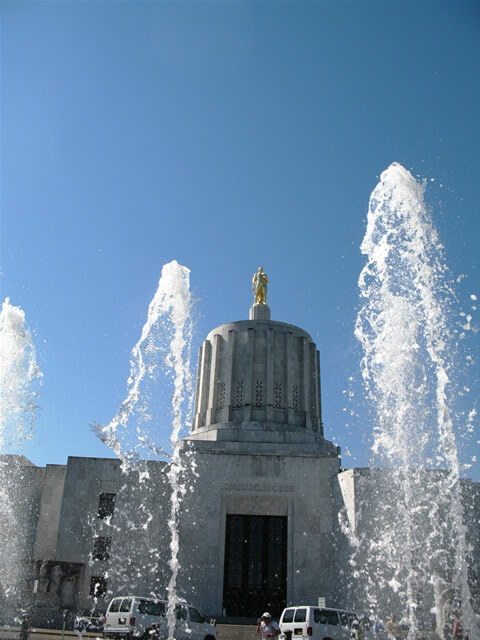 UO programs and the university’s service to the state are highlighted through displays in the Capitol Galleria, student performances in the House and Senate, and visits with legislators. Campus groups participating in this year's event include the award-winning UO Gospel Choir; the Jordan Schnitzer Museum of Art; the Museum of Natural and Cultural History; the Office of Research, Innovation & Graduate Education (RIGE); the Solar Energy Center; the Center for Sustainable Material Chemistry; CAMCOR; the Oregon Bach Festival; PathwayOregon; the Holden Center; and the Sustainable Cities Initiative. The Duck will also be on hand and will be available for individual photo-ops in the Oregon Daily Emerald photo booth. Advocates, joined by UO President Michael Gottfredson, were scheduled to talk with legislators about the reorganization of higher education and the need for added bonding capacity to support the Science Commons project. More than 60 UO advocates traveled to Salem to meet with policy makers in the last such event two years ago.